Offering direct access to the beach, this Koh Samui resort is in the city center and within a 15-minute walk of Chaweng Beach and Chaweng Lake. Chaweng Noi Beach and Bangkok Hospital Samui are also within 3 mi (5 km). Located in Chaweng City Center, this beachfront resort is in the city center and within a 15-minute walk of Chaweng Beach and Chaweng Lake. Chaweng Noi Beach and Bangkok Hospital Samui are also within 3 mi (5 km). 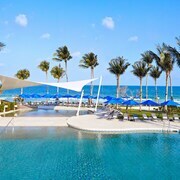 Nestled on the beach, this Chaweng City Center resort is within 3 mi (5 km) of Chaweng Beach, Chaweng Noi Beach, and Bangrak Beach. Fisherman's Village Plaza and Silver Beach are also within 6 mi (10 km). 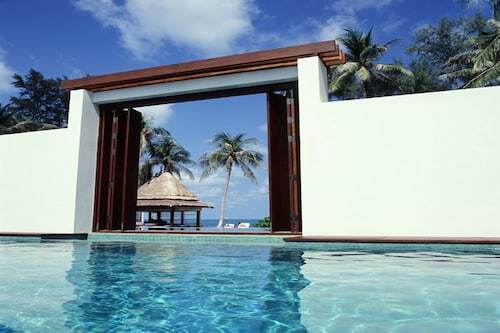 Situated in Koh Samui, this luxury resort is within 1 mi (2 km) of Wat Plai Laem and Choeng Mon Beach. Bangrak Beach and Big Buddha Statue are also within 2 mi (3 km). 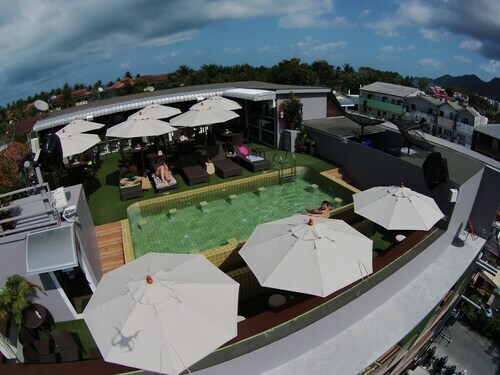 Located in Chaweng City Center, this hotel is within a 10-minute walk of Chaweng Beach and Chaweng Lake. Chaweng Noi Beach and Bangkok Hospital Samui are also within 1 mi (2 km). 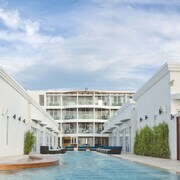 Located in the heart of Koh Samui, this hotel is within a 10-minute walk of Chaweng Beach and Chaweng Noi Beach. Chaweng Lake and Bangkok Hospital Samui are also within 1 mi (2 km). 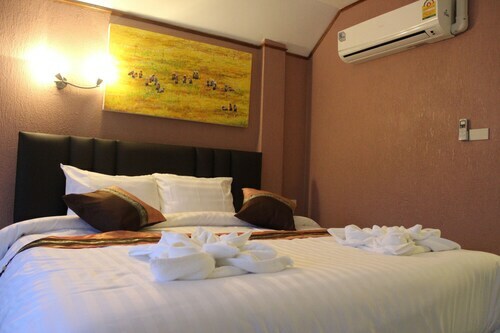 Located in Chaweng City Center, this hotel is steps from Phetch Buncha Thai Boxing Stadium and Chaweng Beach. Chaweng Noi Beach and Chaweng Lake are also within 1 mi (2 km). 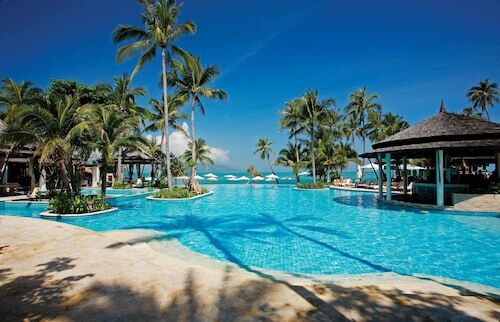 Nestled on the beach, this Koh Samui resort is within 1 mi (2 km) of Samui Go Kart, Bo Phut Beach, and Mae Nam Beach. Fisherman's Village Plaza and Bangrak Beach are also within 3 mi (5 km). 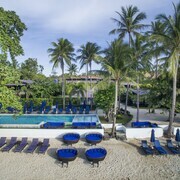 Offering direct access to the beach, this Koh Samui hotel is within a 10-minute walk of Bo Phut Beach and Fisherman's Village Plaza. Bangrak Beach and Mae Nam Beach are also within 2 mi (3 km). 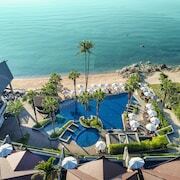 Nestled on the beach, this Koh Samui hotel is within 1 mi (2 km) of Jungle Minigolf and Choeng Mon Beach. Bangrak Beach and Big Buddha Statue are also within 2 mi (3 km). 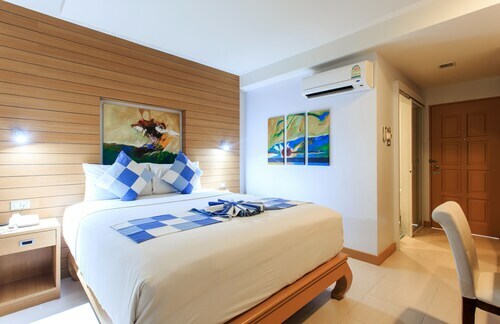 Located in Chaweng City Center, this beachfront resort is in the entertainment district and within a 15-minute walk of Chaweng Beach, Chaweng Noi Beach, and Chaweng Lake. Bangkok Hospital Samui is 0.9 mi (1.5 km) away. Up until the 1990s, the island of Koh Samui in the eastern Gulf of Thailand was like a quiet cousin at family parties, mostly unnoticed and calmly going about its business. Then the quiet cousin went off to college, discovered house music and got really, really tan. 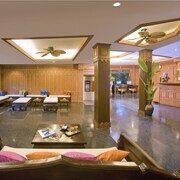 The ‘90s saw the development of tons of places to stay in Koh Samui and the arrival of travellers from around the globe. Now it’s one of the hottest destinations in Southeast Asia, and you’re about to find out why. 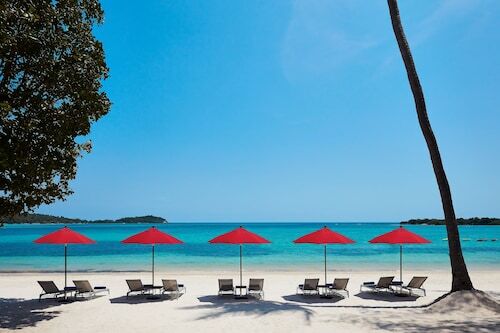 Admit it—you’re booking accommodation in Koh Samui so you can lay around on the beach all day, sipping frosty beverages and checking out the beautiful people. The only question is, which stretch of sand is right for you? Night owls can get their party on at Chaweng Beach, just south of the airport on the island’s east side. If you’re more of an early bird, Bang Rak Beach, on the north coast, is a quieter option; it also makes a great day trip to see the Big Buddha statue. If you’re not quite sure where you fit into the taxonomy of bird euphemisms, head to Lamai Beach. It’s well-developed like Chaweng, but not as rowdy. Accommodation near Lamai Night Market has the added bonus of being near one of Koh Samui’s most happening spots. After a day spent drinking cocktails on the shore, you’ll be glad to soak it all up with the market’s huge selection of delectable dishes. Dig into hot and sour tom yam kung soup and whole salted fish with chilli lime sauce. After all, the best food in Koh Samui is the kind you can look in the eye. Flights to Koh Samui will land at Samui Airport (USM) on its northeast corner, but you’ll probably need a connecting flight to get there. It’s about an hour from Bangkok and two hours from Singapore by plane. If you’re already in the neighbourhood, there’s also ferry service from Donsak Pier in Surat Thani, in the south of Thailand. Once you’re on the island, getting around is easier than tying a sarong. The roads are well-developed, so hire cars are convenient, though they can be pricey. If cash is a concern, rent a motorbike or bicycle and get to and from your Koh Samui accommodation on two wheels instead! There might be one other reason you’re here, besides the beach: party time! 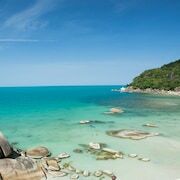 Koh Samui is the best place to catch a ferry to Koh Phangan for its legendary full moon parties. There are loads of ferry terminals on the island, all making the trip to Thong Sala Pier in Koh Phangan. The festivities happen monthly, but party people should time Koh Samui holidays with school breaks in early January, when there will be plenty of like-minded travellers seeking a full moon—party, that is. Another thing they’re seeking: Southeast Asia Buckets. No, you won’t be building sand castles. This is the name given to the quintessential Thai backpacker beverage of whisky, ice, coke and Red Bull all mixed up in a bucket. What could possibly go wrong? If that sounds a little too crazy for you, we don’t blame you. Trade the glowsticks and thumping beats for candles and the sounds of silence during Loi Krathong in November. During this serene holiday, locals float hundreds of tiny rafts of candles and flowers in the lakes, rivers and even the pools of some Koh Samui hotels. Some may even hold events where you can make your own krathong and join in the experience. Sure, drinking on the beach, browsing the markets and snorkelling your way through your holiday technically counts as being outside. But sometimes, you just want a little more action. How about flying at 80km per hour through the treetops with nothing but a cable holding you up? There are a few zip-line companies on the eastern side of the island that can make those (kind of weird) dreams come true. If you prefer to keep your feet on the ground, you can still get high at the Secret Buddha Garden. It’s set at the top of Pom Mountain, one of the highest points on the island, but that’s not the most impressive factoid…this place was built by a 77-year-old farmer! And if he can do that, then you can definitely handle the climb. What if you’re the kind of person who gets disappointed whenever they have to leave the beach, even for eating? 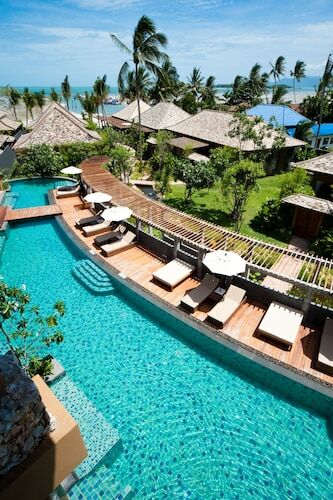 Koh Samui was made for you. Just book a Romantic 7-Course Dinner on the Beach, and the food will come to you. Well, not literally—it will be fresh, but not that fresh. Hmm, did we forget something? Well, we mentioned it briefly above, but it deserves more than that. The Big Buddha statue, aka Wat Phra Yai, is one of the island’s biggest attractions. Even if you’ve only got one day in Koh Samui, you can’t miss it; seriously, you can even see the 12m-tall hulk as you fly into the airport. The statue used to be on its own island, but thanks to development, these days you can walk or drive to it. You’ll still burn off some of those Southeast Asia Buckets, though—the stairs to the top are quite a workout, should you choose to accept it. Big Buddha’s got some competition these days, too. Wat Plai Laem is newer, shinier and has more arms—18 to be exact. It also has its own Buddha statue and plenty of opportunities for selfies. Just be careful what you wish for as you walk around: The many-armed statue is Guanyin, goddess of fertility. 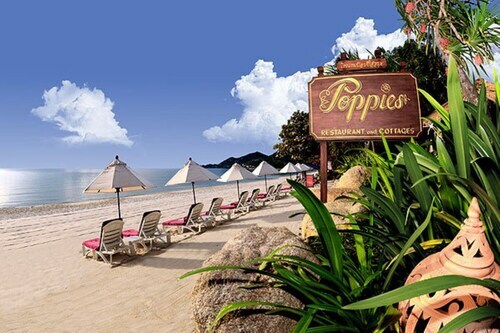 With Wotif’s great selection of hotels in Koh Samui, you’ll feel the island vibes right through your computer screen. Listen to your holiday self—book today, then pack your glow paint and your best day-drinking attire and get ready for tropical fun. 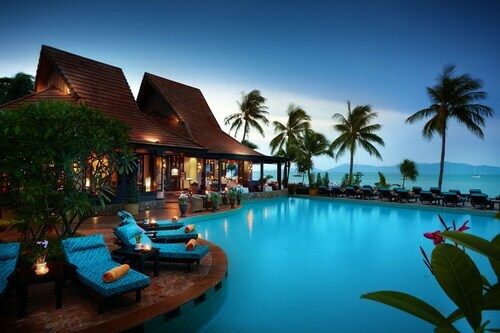 How Much is a Hotel Room in Koh Samui? 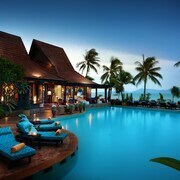 Hotels in Koh Samui start at NZ$19 per night. Prices and availability subject to change. Additional terms may apply. This a perfect spot for families and those who enjoy a quiet holiday in a stunning location. The staff were friendly and happy to assist. The rooms although on the small side were well appointed and clean. absolutely fantastic property and beach but the staff manages to outshine the beauty of the location. Our overall experience was fantastic and really enjoyed our time at Deva! 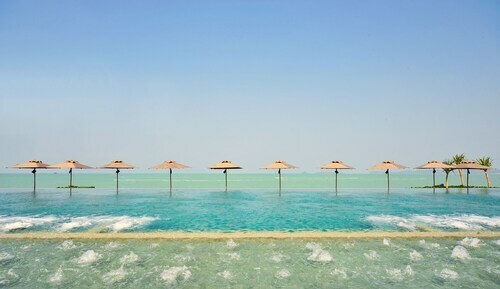 It was very relaxing and calm, away from the hustle and bustle of the main areas, a perfect couples getaway. The 3 pools are great and the beautiful sunset is amazing and romantic. Free kayaks available too, and some decent restaurants walkable. Only thing that was a shame was the 'beach' that it is on is not really swimmable, but the pools made up for this and lovely beaches can be accessed a short drive away.